I am desperate to understand why I cannot keep my desk clear. It is as if the objects that accumulate there have a life of their own. At Christmas, I took two weeks off. One snowy day in late December, I sorted through the piles of paper and organized the piles of books. By the end of a full day, I had reduced the pile of books to the one book I was currently reading and the paper to one two-inch pile. It is now February. There are now six books on my desk. The pile of paper is now four inches high and there is a smaller pile of “urgent” paper beside it. What is “urgent”? The Annual Report of my church for next week’s vestry meeting is “urgent”. The incorrect reservation for my trip to London, England in May Is clearly “urgent” since it must be changed. The details on how to set up a simple crystal meth lab using readily available household supplies are on the “urgent” pile because I need to check whether one of my patients could have done set up such a laboratory. I realize that this sounds far-fetched, but the situation is real and could be “urgent”. The “urgent” pile is every item that must be addressed quickly. What is on the other four-inch pile of paper? The book review for a textbook that I’d like to buy, this month’s edition of my favourite literary magazine, and the newsletter for the Osler Library have all crept onto this pile and snuggled in between recipes, newspaper articles and Aunt Stella’s letter. The last item may need to be moved to the “urgent” pile to be answered in decent time. There is also the pile of books, of course, but, since these are all library books, it seems to me that they don’t count as my pile. I am a psychiatrist. I spend entire days helping others figure out why they behave as they do, but I am completely crippled by one small housekeeping task. I have read more self-help books and consulted more websites on the topic of office organization than I ever thought existed. There are so many books and websites on this topic that there are lists of the top websites and books about organization. Most of these lists rate the top ten books or websites on organization, but one poor reviewer couldn’t even declutter the list and so she has listed the “Top 15 Books on Organization”. The problem with these references is that they consider all of my paper to be “clutter”. The references consider my papers and articles and objects to be unnecessary, even a hindrance, for productive living. All these experts look upon the elimination of these piles of paper and books on my desk as a housekeeping task. But, as I said at the beginning, the objects and paper have a life of their own. These lives begin in my imagination. They are the offspring of my wish for my life to be more than I can manage. I am not ready to eliminate some of the tasks I have assigned myself with these piles of paper so that I can “declutter”. I want to hold onto the people, events, or activities that each book or piece of paper or object represents. Consider the life each of these items has. Consider my aunt’s letter. I know that when my aunt dies, the letters written in her hand, using the phrases she used, will bring her to mind more vividly than my memory alone can do. Recipes are often collected less for me than for my husband, or my children, or a friend. Knowing how to set up a crystal meth lab will illustrate to a young man with a bad drug habit that I am perfectly aware of how risky his life has become. I consider each of these objects to be artifacts and I am a curator of sorts, acquiring in piles that must be sorted the items necessary for a retrospective, personal exhibit of this current era in my life. When I have time, and when my aunt is much in my mind and I feel like speaking with her, I will take the letter she has written and answer it. There must be time to consider what she has said and respond. Then I will save the letter in the correspondence file I have of all her letters to me. This file is truly alive and so it is no wonder that the pieces of the file insinuate their way onto a pile on my desk before they get to the place where they will finally live. They want my companionship. Similarly, the recipes I save are eventually scanned, or found online and saved to an online recipe collection, ready to be the main dish in a family birthday celebration or a special treat for a friend. This collection has become so like an exhibit that my family and friends ask for regular access to the collection or for items from it. Finally, such ephemera as the instructions for a crystal meth lab are meant to be temporary exhibits, to be used in the service of a single event or circumstance. If recorded at all for posterity, this research will be documented as a footnote in my patient’s electronic medical record. Perhaps this vision of myself as a curator of small exhibits, shown only to a limited public or for personal enjoyment is too grandiose. Perhaps it is just my excuse for the fact that I never seem to be able to keep my desk uncluttered. But I know that I am not unique in this curatorial style. I am suspicious that the organizational experts with tidy desks cannot truly understand my wish to catalogue and deliberately acquire emotional artifacts. How do they organize their inner lives? Are they ever on exhibit? 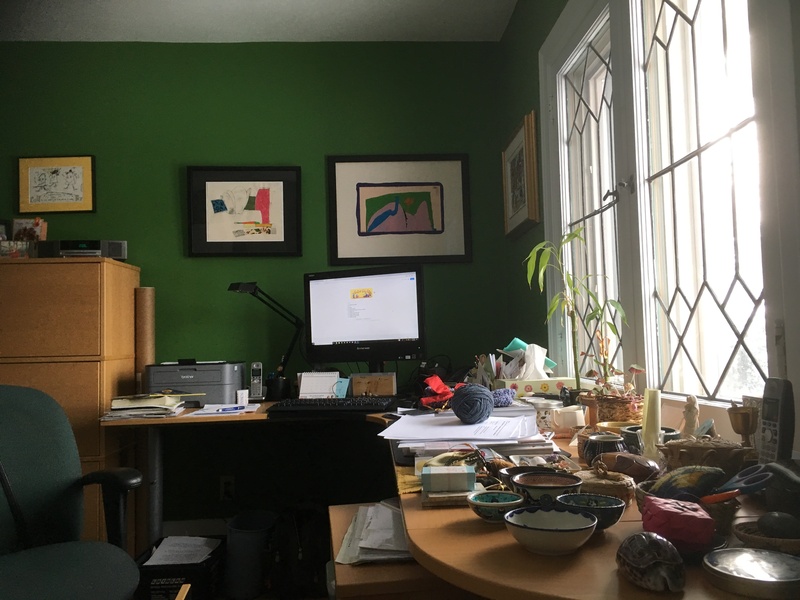 Those of us who maintain these small collections of personal literary memorabilia, longing at times for clear work surfaces and tidy desks, are often also the chroniclers. Our artifacts are our inspiration – for letters, for reports, for speeches, for essays. Why else do we keep files of letters and notebooks of quotations? Who but us will leave the evidence of what daily life was like in our times? From pictographs in caves, to hieroglyphics in tombs, to the Dead Sea Scrolls, to illuminated manuscripts, to the Gutenberg Bible, to Penguin classics, to the Cloud, we have left our mark over the centuries. We have informed our descendants about the life of our times. While historical figures of every period and nation have kept tidy desks and fashioned careful histories of the legacies they prefer, those of us whose only goal was to capture personal memories for private exhibits leave a very different legacy. Our recipes, letters and vestry reports left behind on untidy desks and in filing cabinets and on hard drives have lives of their own, our lives. We do not have time to organize everything into a well-shaped monument, or to order the possessions in our tombs. We will be found frozen in time, like the citizens of Pompeii, at the moment our lives stopped, still working on tidying our desks, still writing.